The history of Macon’s restaurant chefs and restaurateurs is as interesting and unique as the long history of our hometown city itself. Within the city streets of downtown Macon to the county roads of Bibb, these icons of the restaurant business have created a dynasty contributing to our city’s palate of personality and fueling our local economy. These are the individuals and families that have helped shape the local culinary scene while setting the tone for the region when it comes to authenticity, quality and taste of locally prepared food. We present to you Macon’s Aristocracy of Food. There is probably no institution that is more directly connected to the roots of Macon dining, and no other woman that has achieved a superior degree of culinary distinction than Mama Louise and her legendary H&H Restaurant. Hudson, better known as” Mama Louise,” opened her soul food restaurant in 1959 with Inez Hill or “Mama Hill” and together they have nourished the souls of all who entered the Cotton Avenue establishment. Mama Louise was nearly 40 years old when she was introduced to Gregg Allman and his band of southern rockers. The Allman Brothers Band would later take her on tour at the height of their popularity, but Mama never cooked a thing. She just enjoyed a well-deserved vacation. Now in her eighties, Mama Louise doesn't do the cooking anymore, but she still comes into the restaurant every day to make sure it's done right. She even has her own chair reserved at the head of the restaurant, where she accepts thanks and gratitude from visitors. Macon’s rich BBQ history can be traced all the way back to 1935 and just 5 miles outside of downtown to a man named Doug “Dude” Fincher, Sr. who lit the first fire at Fincher’s BBQ on Houston Avenue. 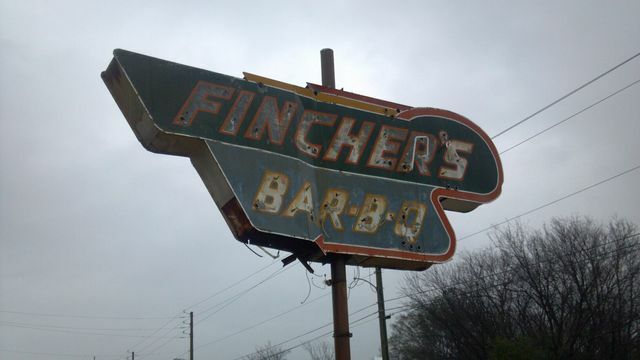 Since then, the Fincher family has been smoking BBQ in Middle-Georgia for over 80 years. All barbecue men. All family. All working in the same smoky space over distinctly different eras to produce some of the best BBQ you ever put into your mouth. Dude Fincher was an integral figure in his flagship store on Houston Avenue until his death in 1998, leaving a legacy of legendary barbecue to his son and namesake. Doug Jr. with his wife Alice at his side, took his father’s modest barbeque joint and turned it into a prosperous business that is now carried on by his children and grandchildren. It was Under Big Doug’s reign that Fincher's Barbecue gained a reputation for barbecue that was "out-of-this-world;" literally. When Space Shuttle Discovery NASA Space Mission STS-33 lifted off on November 22, 1989, astronaut and Fincher’s high school classmate Sonny Carter, carried on board with him containers of freeze-dried wood-smoked ham from Fincher's. Big Doug passed away in 2013, leaving his family’s legacy to Ms. Alice and his sons to carry on for future generations. Located at the end of the counter sits an empty bar stool with a plaque that is a memorial to Big Doug. If you linger near the kitchen during lunch, you just might be lucky enough to hear the stories of Dude and Big Doug behind the Fincher’s fabled smoke pits. On any given day, you’ll be hard pressed to find a parking spot at John McCord’s New Street BBQ restaurant and at night diners line up along Vineville Avenue for a seat at Skipper Zimmerman’s Seafood Restaurant. While seafood and barbeque may sound like an unlikely pairing, the Fish n’ Pig is one of Macon’s favorite combinations of two paramount restaurants: Satterfield’s and Jim Shaw’s. Armed with a personality and wit that is second to none, McCord has spent his culinary career feeding and entertaining locals as well as music’s elite. Some of McCord’s catering clientele includes Rolling Stones pianist Chuck Leavell, Grammy Award-winning blues musician Taj Mahal and Rolling Stone Magazine’s 100 Greatest Guitarists, Derek Trucks. While the closest ocean is hundreds of miles away, Zimmerman puts Macon on the map as a prime destination for fresh seafood. With a knowledge of seafood that is backed by decades of experience, Skipper Zimmerman has been at the forefront of seafood locally since he first opened Skipper’s Seafood back in 1979. Equipped with proficiency for knowing what their patrons like, Zimmerman and McCord cooked up an idea to bring their two unique flavors together under one roof. This foodie child of love was aptly named “The Fish n’ Pig” restaurant. Individually these two restaurateurs qualify as local foodie legends, but together they have formed something bigger. They have become a force that has shaped the course of Macon’s food history. Macon, Georgia is famous for its history, musical heritage and big personalities. But, it’s also famous for its hot dogs—Nu-Way Weiners to be precise. The Nu-Way weiner itself echos a century's worth of growth and progress in American culture. Nu-Way was started in 1916 by a Greek immigrant named of James Mallis. When Mallis arrived in Macon, he bought the original storefront location on Cotton Avenue. Shortly after setting up shop Mallis saw that hot dogs were all the rage in New York and other large cities and he wasted no time in converting his fruit stand into a hot dog stand. At the turn of the century, customarily Greek immigrants in the restaurant business would run their restaurant for 3-5 years, then sell it to their brother(s) and head back to the homeland only to return again years later. This family tradition has been going strong for generations of Dermatas and Cacavias men.The current Nu-way co-owners, Spyros Dermatas and James Cacavias inherited the this family operation directly from their fathers, Nick and John respectively. Carrying on a 100 year tradition of serving Middle Georgians and bring international recognition to their home town has put Spyros and James on the short list for our Aristocracy of Food. Perhaps now more than ever, the world's ears are tuned to the stories of the immigrant experience; and Natalia del Basso-Orsini’s tale is no different. Growing up in Pescara, Italy, Natalia had big dreams, dreams that wouldn’t come to fruition until after she came to America and worked for Frank Fenter, an immigrant who left London for Macon to co-found Capricorn Records. She left her motherland bound for Georgia in the 1970s and began her culinary rise at Fenter’s Le Bistro; a once popular French restaurant in downtown Macon. Through hard work and dedication and with the help of of her friend and coworker Leo Asimakopoulos, Natalia grew her confidence as well as her own unique passion that gave her the push to make her dreams a reality. Named for her dynamic Italian owner, Natalia’s restaurant opened in 1984 and quickly became the name most equated with excellence in dining in the mid-state area. Today, Natalia’s stands out as one of the best dining experiences around. Natalia’s sets the standard and continues to raise the bar for what it means to be a fine dining establishment associated with Macon's ever-evolving culinary landscape. Food and flavor in the del Basso-Orsini family continues to run as deep as the Aterno-Pescara river in Italy and now Natalia’s daughter Natasha, feeling the pull of her roots, is carrying on the culinary legacy as she celebrates traditional practices and flavors at her own restaurant, Fountain of Juice.